Designated Survivor is set to premiere on ABC at 10/9c on Wednesdays this fall! Jack Bauer is heading to the White House. 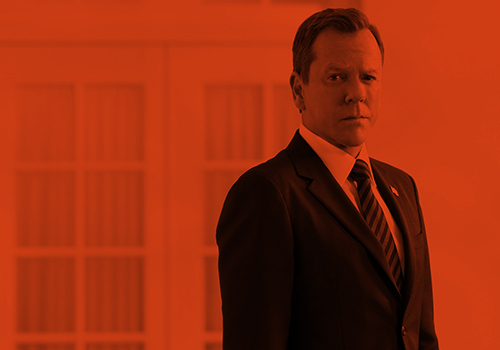 Kiefer Sutherland is returning to primetime television with Designated Survivor, an ABC conspiracy thriller drama, in which the 24 star will play the President of the United States. Designated Survivor, which was written on spec by David Guggenheim (Safe House), has received a straight-to-series order. The script, with Sutherland attached to star and Simon Kinberg (The Martian, X-Men, Days Of Future Past) to executive produce for the Mark Gordon Company, sparked a major bidding war before landing at ABC. In Designated Survivor, a lower level United States Cabinet member (Sutherland) is suddenly appointed President after a catastrophic attack during the State of the Union kills everyone above him in the Presidential line of succession. This is a family drama wrapped around a conspiracy thriller about an ordinary man in an extraordinary situation. Creator Guggenheim executive produces alongside Kinberg, who will exec produce via his Genre Films banner, Sutherland and Entertainment 360’s Suzan Bymel. This marks the first production order for the Mark Gordon Co. since it went independent earlier this year as the Mark Gordon Company Studios, backed by Entertainment One. The MGC will serve as the lead studio, with ABC Studios as a studio partner on the series. EOne will handle international distribution. The title of the project, Designated Survivor, refers to the term used for a member of the U.S Cabinet who is sequestered in a safe location when the President and the country’s other top leaders are gathered in one place, such as during State of the Union addresses and presidential inaugurations. The policy is designed to preserve continuity of government in the event of a catastrophic occurrence when the President and those in line of succession are killed, leaving the designated survivor to become the Acting President of the United States under the Presidential Succession Act. There already is a drama titled Designated Survivor in the works for next season. The project, set up at Fox, is being written by Nikki Toscano and exec produced by Johnny Depp. In Fox’s Designated Survivor, when the President, VP, and Cabinet all meet in one location for an event such as the State of the Union, one Cabinet member is conspicuously missing: the Designated Survivor. Hidden away in an undisclosed location with Presidential-level security, the Designated Survivor is ready to take the reins of the President should the unthinkable happen and the rest of the government is wiped out in an attack. ABC’s green light to the Kiefer Sutherland series will likely impact the fate of the similarly-themed project at Fox. MGC also has legal drama Conviction in development at ABC with a put pilot commitment, with ABC Studios co-producing. Since becoming independent, MGC also has stepped in to finance and produce a limited series adaptation of Jennifer Steil’s novel The Ambassador’s Wife, with Anne Hathaway set to star and produce, and has teamed with Francis Lawrence for two drama projects. During Mark Gordon CQuantico 1o.’s stint as a pod based at ABC Studios, the company launched a number of series. It has several on the air — ABC’s veteran Grey’s Anatomy and breakout Quantico, CBS’ Criminal Minds and the upcoming Criminal Minds: Beyond Borders as well as the Showtime drama series Ray Donovan outside of the ABC Studios deal. In addition to Safe House and its upcoming sequel, Guggenheim’s feature credits include Stolen and the upcoming Bad Boys 3, Black Box and the franchise reboot of Commando. In TV, he previously co-wrote and co-executive produced with Alex Kurtzman and Bob Orci the Fox pilot Exit Strategy starring Ethan Hawke and directed by Antoine Fuqua. He is repped by Paradigm, Madhouse and attorney Jamie Afifi. Kinberg, who wrote and is producing the upcoming X-Men: Apocalypse and recently produced The Martian, is executive producing two X-Men-themed TV series projects, pilot Legion at FX and Hellfire at Fox. Sutherland won an Emmy, Golden Globe and SAG Award for his signature role as Agent Jack Bauer on Fox’s Emmy-winning drama series 24 and reprised his role in the 24: Live Another Day event series. There is a new 24 event series eying a green light that revolves around new characters.